This continues to be an unusual market, with most of the heavy lifting being done in the overnight Globex futures session, and then the market trading range bound for most of the day. The trade for the last couple weeks has been to buy the afternoon dip and sell the next morning's rip. The rally has now marginally exceeded my near-term projected target from July 2 of 1644-1652 (after failing to reach the downside corrective target of that same date by a few points, due to a rare running flat). I'm inclined to believe it's close to beginning a corrective sequence, however there is absolutely nothing in the charts yet to suggest this. I'm going purely on my read of the waves, but this is unadulterated front-running in a vague market, so don't leverage the ranch on this. 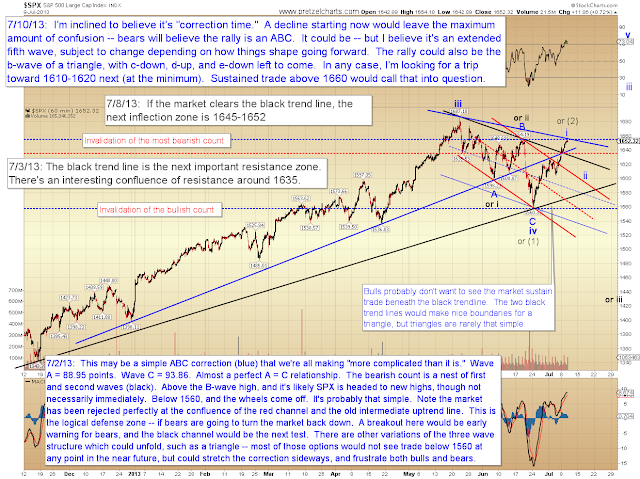 Bigger picture, the market would leave maximum confusion if it began a correction now, which is sometimes a good argument in itself. 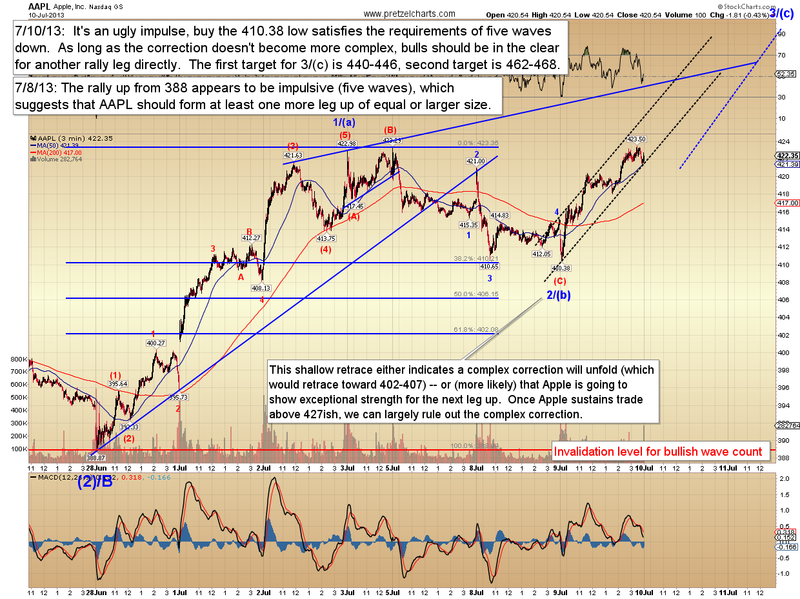 Apple (AAPL) fell a few points shy of my downside target, though the correction overall played pretty darn close to my projected path from Monday, with wave 2 being sold immediately at the open. 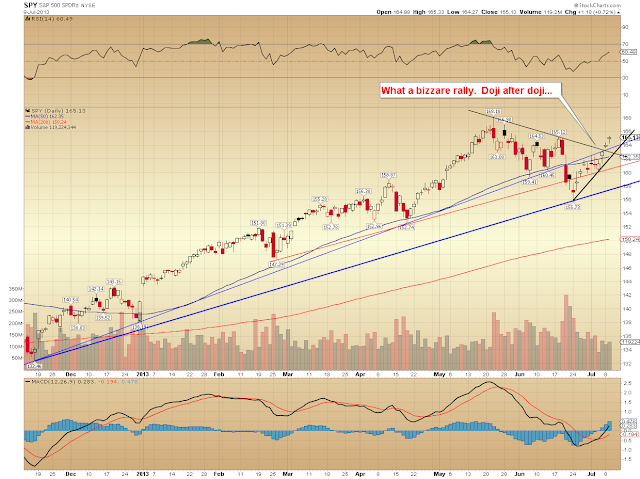 It failed to reach downside targets because the fifth wave of the decline was unusually and unpredictably shallow -- which is generally a sign of strength and a good signal for Apple bulls. 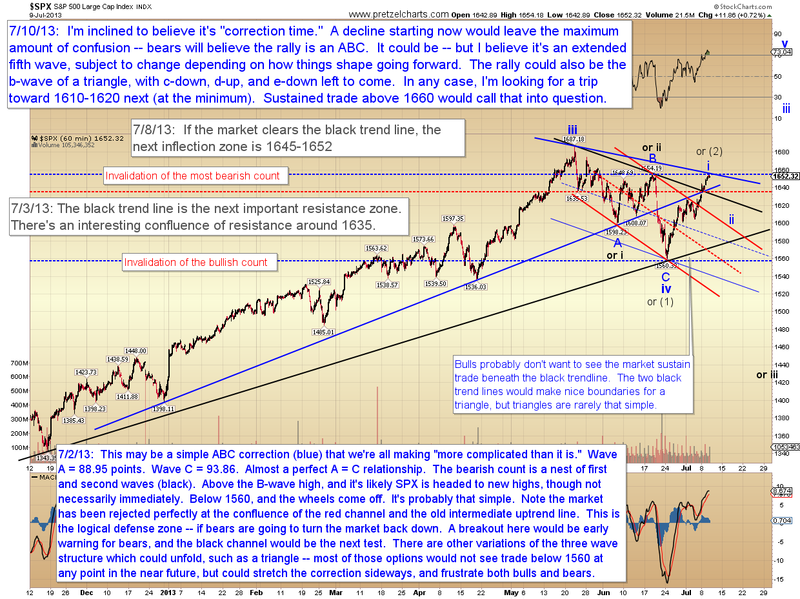 The alternate possibility is a more complex corrective sequence, which visits the original target zone -- I'm unable to rule that potential out, but the sheer number of buyers waiting at 410 suggests that level will hold for a while. The next upside target is 440-446. 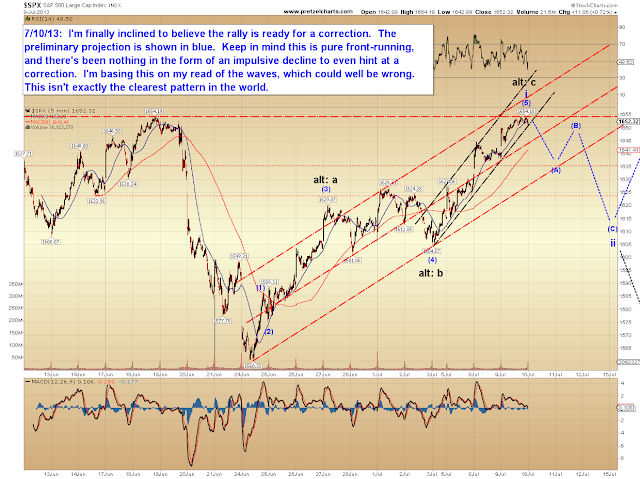 In conclusion, the rally has now extended a bit beyond my target zone for this leg, but may be (and I have to stress "maybe") ready to correct. 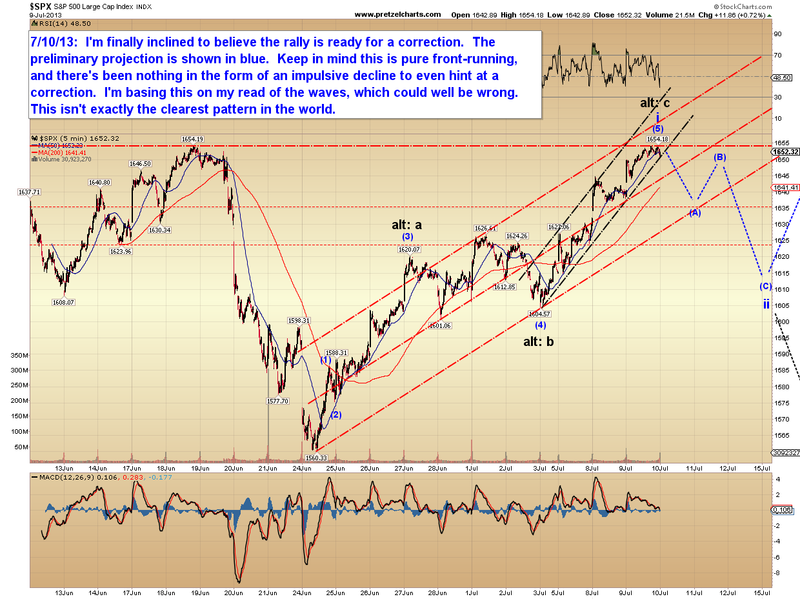 With no downward impulse waves yet in place, my projection must be treated as speculative at this point. In the bigger picture, while there are still bearish potentials, most indicators have now flipped to buy signals, which suggests the next dip will be bought -- though most of us probably don't "want" to believe that. 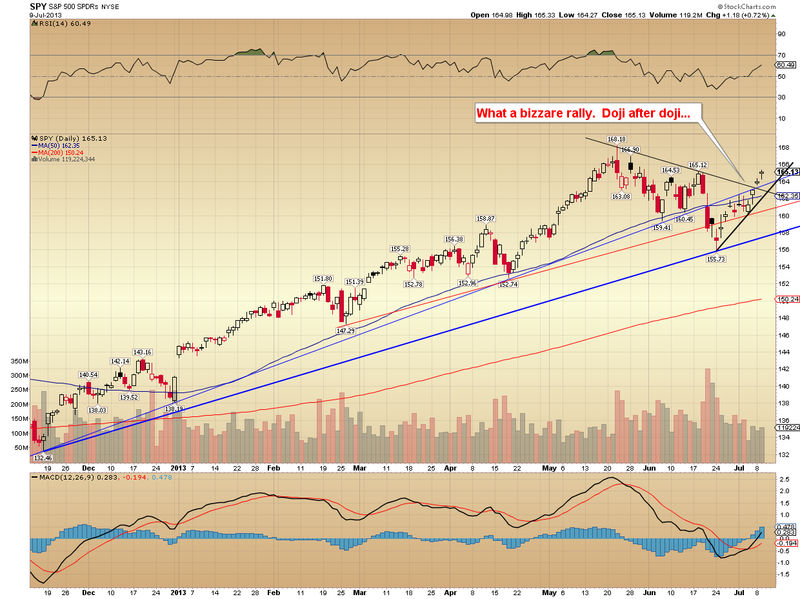 We'll simply have to play the next dip by ear as it unfolds. Trade safe.